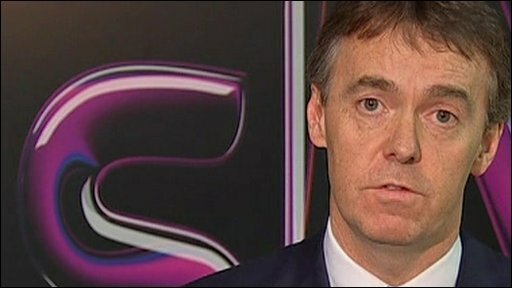 Jeremy Darroch, BSkyB: "We think this is a decision Ofcom has got badly wrong"
Regulator Ofcom has told Sky it must cut the price it charges rival cable, terrestrial and internet broadcasters to show its premium sports channels. The broadcaster will have to sell Sky Sports 1 and 2 for up to 23% less than the current wholesale price. The decision - part of the result of a three-year inquiry - aims to offer viewers more choice of pay-TV services. Sky said it would appeal against the "unwarranted intervention", arguing it would be to the detriment of consumers. "This is a marketplace where customers are well served with high levels of choice and innovation," Sky said. "Consumers will not benefit if regulators blunt incentives to invest and take risks." Sky will have to sell Sky Sports 1 and 2 for £10.63 a month each - 23.4% less than at present. If the two channels are sold together, Ofcom has set a price of £17.14 - a discount of 10.5% on current wholesale charges. Bodies representing football, rugby and cricket - which rely on lucrative TV rights deals - fear the decision will mean less money going into sport and will impact their ability to invest in grassroots participation. 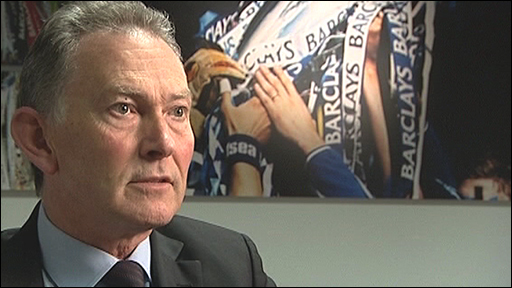 Richard Scudamore, chief executive of the Premier League, criticised Ofcom's decision as "ill-judged and disproportionate". He said: "[Ofcom's] proposed action will strip out competition for sports rights and hugely reduce the incentives of all bidders, Sky included, to invest in sports rights. "The effect will be to subsidise companies that have shown little appetite for investing in our content and fundamentally damage the investment models that have helped sport become a successful part of the UK economy and made sport so attractive to UK consumers. "Of course, we will be considering Ofcom's findings in full and do not rule out a challenge to protect the interests of fans, clubs and the wider game," he added. The Rugby Football Union (RFU) said it was seeking legal advice on the ruling. "Ofcom's proposed approach effectively confiscates our rights and donates them to organisations who have consistently declined to invest in sports rights despite having balance sheets that dwarf Sky's," RFU chief executive Francis Baron said. Ofcom said its decisions would come into effect immediately, meaning consumers should start to see new TV packages in time for the start of the next football season. BT Vision said it hoped to offer Sky Sports 1 and 2 cheaper than Sky by then. But it added: "Ofcom should have gone much further than it did. "They should have included all Sky Sports channels, not just two. The wholesale price for the two sports channels is higher than the regulator had previously suggested." It also complained that Ofcom had not set a regulated price for HD channels. As part of what could be a major shake-up of the pay-TV industry, Sky has also been given permission to offer pay-TV services on Freeview, replacing Sky's current free channels. This, however, is conditional on Sky implementing the wholesale part of the deal, Ofcom said. If it decides to offer movie channels on digital terrestrial, it must also offer these to competitors such as BT vision and Top Up TV, the regulator added. The move could mean 10 million Freeview-only homes having access to Sky's premium sport channels for the first time. Ofcom estimates this could lead to up to two million more people subscribing to premium TV channels in the next five years. "Consumers will in the future enjoy a greater range of innovative services following fresh investment by competing pay-TV providers," it said. The broadcast regulator also found that Sky's dominance in the supply of premium movies was restricting viewer choice, particularly when it comes to video-on-demand services. However, it said it did not have the necessary powers to address these concerns and proposed referring the matter to the Competition Commission for them to look into. Competitors had hoped that Ofcom would also set lower wholesale prices for film channels. Ofcom's inquiry began in 2007 after BT, Virgin, Top Up TV and the now defunct Setanta, expressed concerns about Sky's dominance of the pay-TV industry. It has an estimated 85% of the market. Sky shares were the biggest risers on the FTSE by midday, up almost 3% at 599 pence.